Hello Everyone! Today we start our Stamp Highlights with Sunday Stroll! Over the next few days, our Design Team will show you what they have done with this month's new release! It looks like the DT had lots of fun to creating with the set! Laura created a fun scene by masking all of the images in Sunday Stroll & adding a sentiment from Sunday Sentiments. It's so easy to create a scene card with the Sunday Stroll Stamp Set! 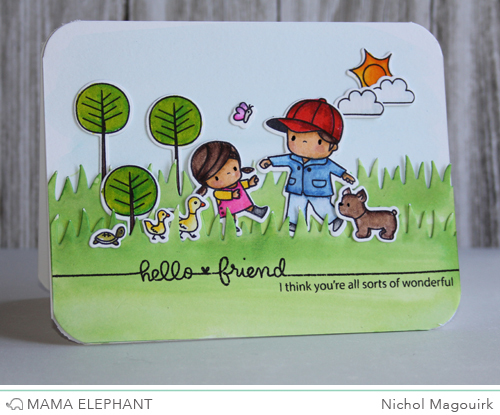 Nichol added a watercolored background and grassy border with a stamped greeting from the Sunday Sentiments for a sweet scene sure to brighten anyone's day. Pamela stamped a line of adorable ducks and used the little arrows to highlight the last duckling. 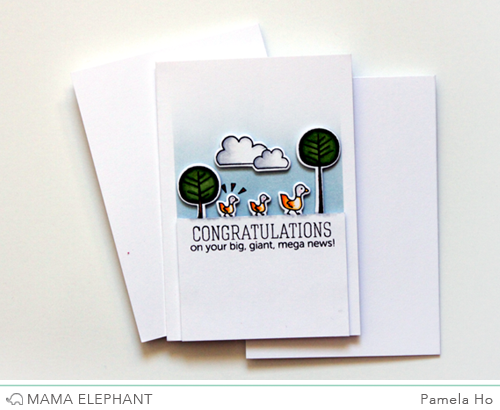 She used a sentiment from Ella & Friends to finish off this cute baby congratulations card. The little girl has great aim! Elena's sweet scene shows that the possibilities are endless with this set! The wavy banner and sentiment from Charmed work well together here too! We love how Nicole created the watercolor background for this CAS card, and used the two images to make it look like they're holding hands. So sweet! We totally dig this wonderful patterned card from May! How awesomely clever! She also used a sentiment from Sunday Sentiments. Thanks again for joining us today! Come back tomorrow as we highlight another set! I love how each of the DT girls created a cute scene with this set...so fun! I can't wait until mine gets here so I can play with it! I LOVE this set! it's so awesome because it's got such a variety of stamps so you can get a different look Every time! The Sunday sentiments are asesome also!! The cards made with this set are all so cute! Oh these cards are soo sweet! I love all the lil scenes! the cards are so cute. Love the paper in the last project. These sets are adorable. The DT made the cutest cards with them. This set is absolutely precious!!! Oh my, these cards are so pretty! Great cards! Designers did a wonderful job highlighting the new stamp set. Love all these cards. Thank you for sharing. Everyone did an amazing job with their cards. 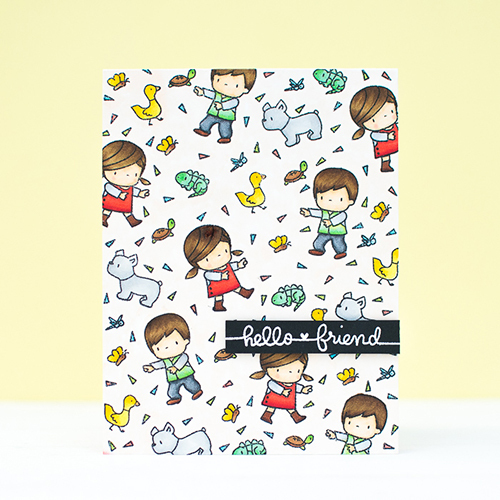 May's use of this adorable stamp set to make a background is truly clever and the card looks fantastic! Wow! Such cuteness! Thanks for sharing today!! I'm drooling! I love all of these cards! I don't know how I missed this post bout I'm glad I saw it now how cute are the inspiration?! I love all of them!